Some mods are available, and a somewhat active modding community still exists. 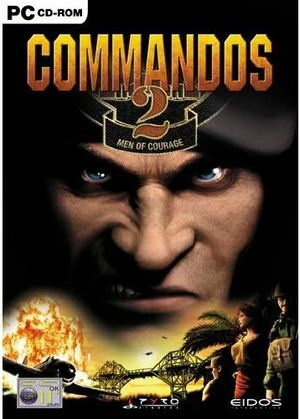 OS X version only available bundled with Commandos 3: Destination Berlin. 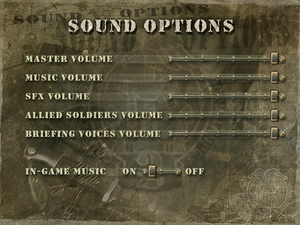 Bundled with Commandos 3: Destination Berlin. Cannot be purchased in Germany. The latest official patch for the retail release is 1.2. Digital releases are already patched. Destination Paris is a mod that makes the game more challenging. A modding community for the game still exists. Horizontal resolutions above 1440px not working properly. 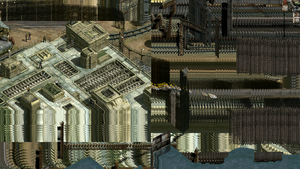 Example of graphical glitch experienced with horizontal resolution of 1920px. Widescreen-ready executables - Just pick the one you want, rename the old one, put the new executable and rename it to "comm2". 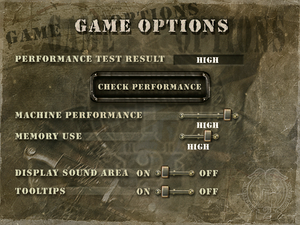 When you start the game, choose 800x600 resolution. Retail versions need to have 1.2 patch (mirror) installed to work. Destination Paris will not work with this. You need to override one (or more) of the four built-in resolution options with the custom resolution(s) you want. Horizontal resolutions above 1440px, when playing non-tutorial missions, cause major graphical glitches and also crashes the game when zooming. Open comm2.exe with a hex editor such as HxD (you might need to run the editor as an administrator). For other values, see this list of hex values. Save your changes and close the hex editor. Run the game, and under "Options" select (one of) the resolution(s) you hacked (it will still be listed as the original resolution). Unfortunately, playing the game windowed appears to disable edge-scrolling. To enable windowed, just press Alt+↵ Enter at any time in-game. Only the keyboard hot-keys are remappable. ↑ 3.0 3.1 File/folder structure within this directory reflects the path(s) listed for Windows and/or Steam game data (use Wine regedit to access Windows registry paths). Games with Steam Cloud support may store data in ~/.steam/steam/userdata/<user-id>/6830/ in addition to or instead of this directory. The app ID (6830) may differ in some cases. Treat backslashes as forward slashes. See the glossary page for details.